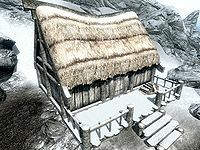 Fruki's House is a small house in Dawnstar, and the residence of Fruki. It is located north of Quicksilver Mine. It is at the farthest edge of town next to Quicksilver Mine, facing the bay on the opposite side from Silus Vesuius's house. In front is the jetty that The Sea Squall is moored at and next to the house is the smelter that the miners use. There are steps leading up to an enclosed deck in front of the house. The rocks and snow pile up quite close to the rear of the property. On your left upon entering there is a single owned bed in the eastern corner. In the middle of the southeast wall is a food barrel next to a tall wardrobe with an unlocked chest atop, which contains only minor loot. Another single owned bed is in the southern corner, with a pair of boots by the foot of the bed. There is a fireplace opposite the door on the southwest wall with a cooking pot in front and a pickaxe on the hearth. To the left of the fireplace is a rack hanging from the ceiling holding three rabbits. To the right of the fireplace is a long wooden table and bench. 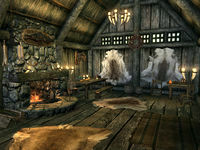 On the table are several loaves of bread, two bottles of Nord mead, a bottle of alto wine, a cabbage and an eidar cheese wedge. In the northern corner of the room is a square wooden table and two chairs. On this table is another pickaxe, a large coin purse, two bottles of Nord mead, a flute and five loose coins.